thanks so much for continuing the Hop. You have a lot of fun in store with these gals! 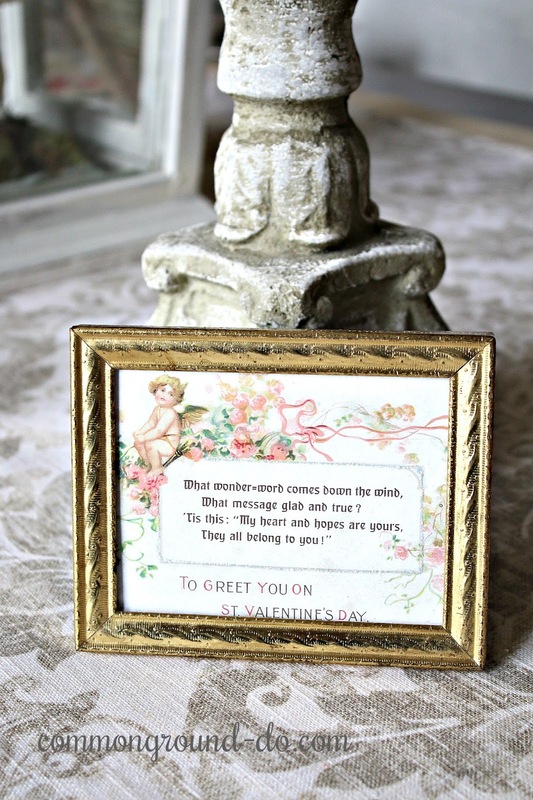 I like to decorate for every holiday and season by bringing out a few of my vintage or antique pieces that convey the holiday thought or theme. 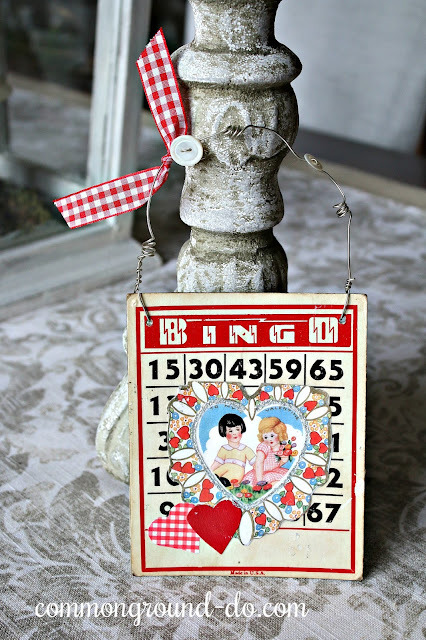 For Valentine's Day it's fun to use vintage items that emote love, romance or friendship. 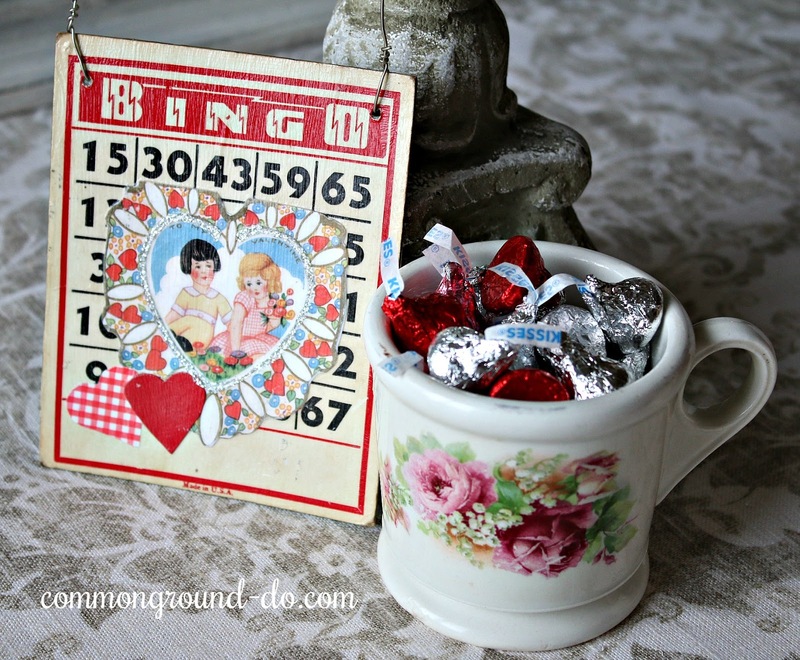 Here are a few ideas for ways to "decorate" for Valentine's Day with small vintage decorative items. I like to give small gifts to family and friends that are unique and fun for holidays or a little "extra gift" for Birthdays and Christmas. Definitely a box of specialty chocolates are a wonderful sweet surprise for Valentine's Day, but adding on a small friendship gift makes it extra thoughtful and personal. 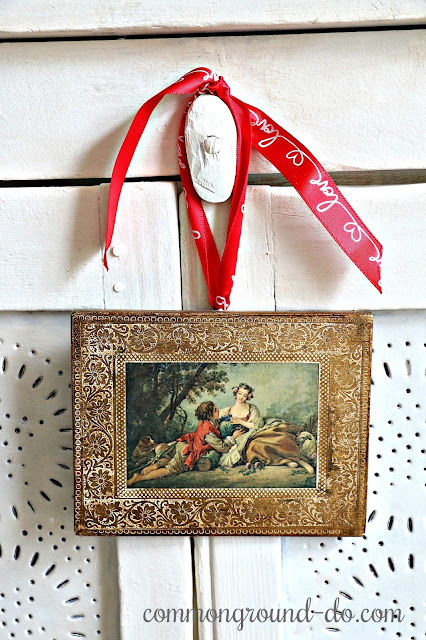 I have a love of using decorative ribbon that is seasonal or holiday themed. You can add it to almost anything to dress it up and make a small "insignificant" looking item seem to take on more importance and "festive-ness" (can I make up my own word for this?) 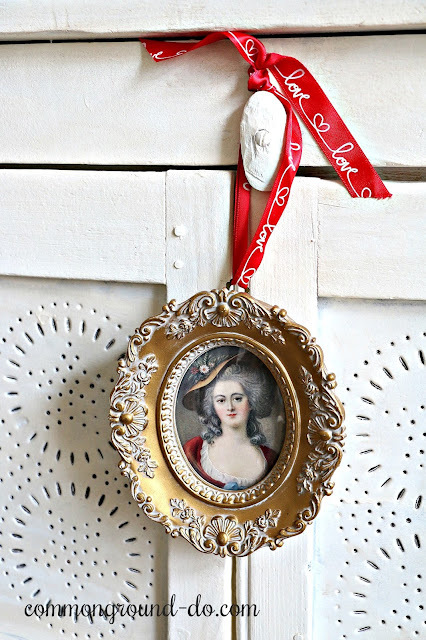 In short... you can make anything look more fun and holiday appropriate with a well placed ribbon! 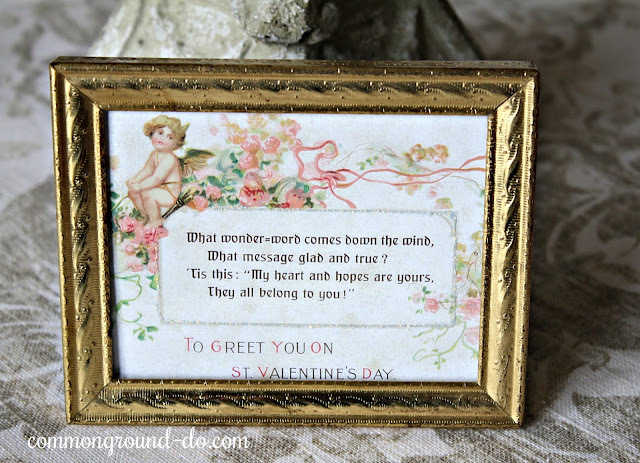 I love small prints as you all may know, and enjoy changing them up for different holidays. 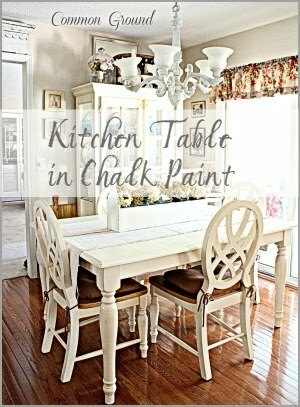 When I'm out at a vintage market or flea, I'm always on the look out for inexpensive pieces that I can use for my Entry Console or in the Kitchen on the Baker's Rack. Here, I've added a small ribbon for Valentine's Day that says "LOVE" in a white script on a red background. I've hung these small "Florentine" prints temporarily from my antique pierced tin pie safe that I keep in my office for art supplies. 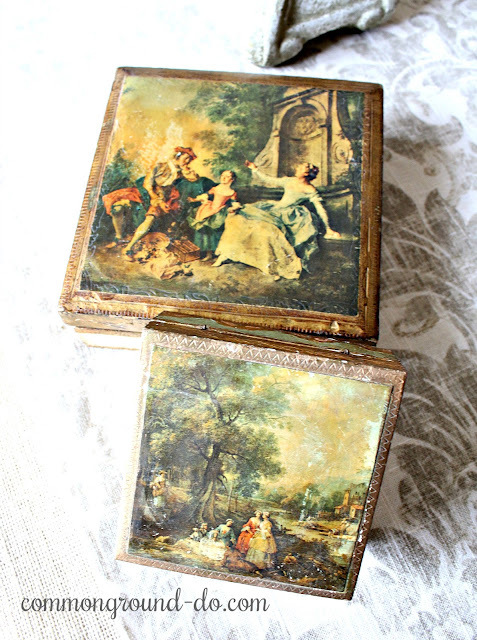 These type of boxes and prints may be more expensive on Etsy, but if you shop the vintage markets and fleas you can find them to be far less pricey. I have a small collection of vintage jewelry caskets from the 50's and 60's that are feminine and a sweet way to showcase a special piece of jewelry. 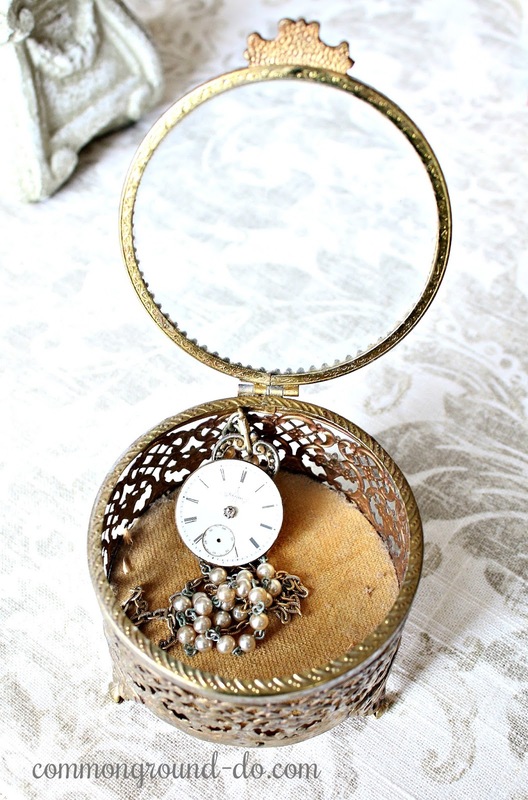 This is a piece I made several years ago out of an old pocket watch face. Etsy has many sellers of vintage jewelry assemblages. 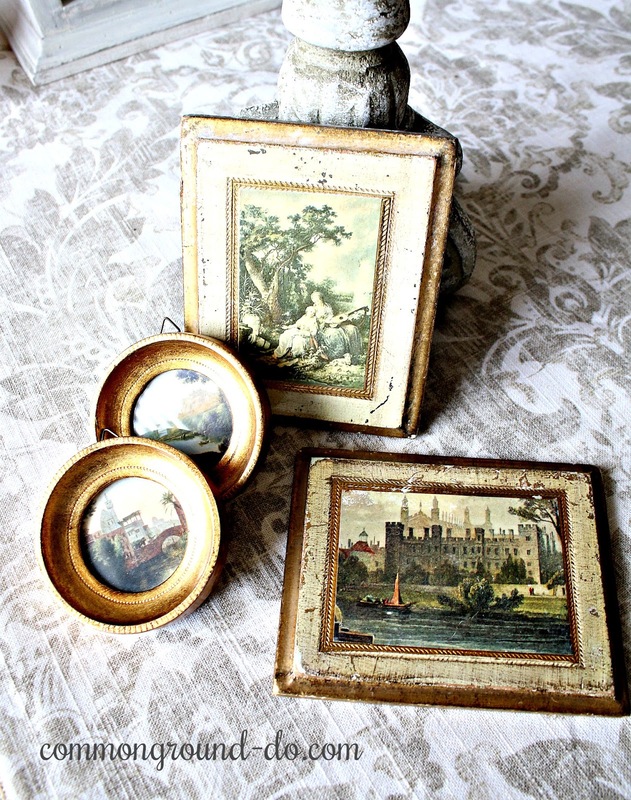 These are small jewelry boxes, that I imagine are from the 40's and 50's. 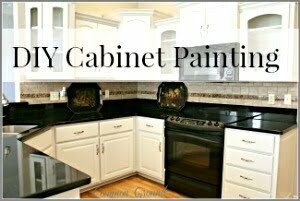 not large, but the right size to add a little romance to your vanity. 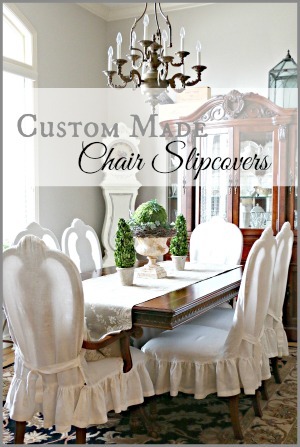 You can be creative and store other items than just jewelry. 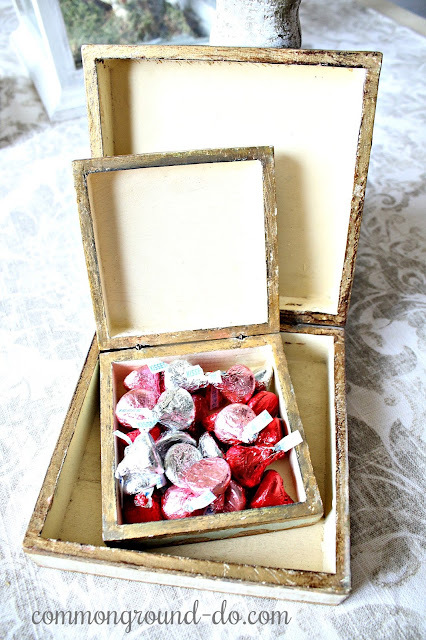 More "Florentine" boxes... why not fill them with something sweet? but right now Hershey's Kisses will have to do. 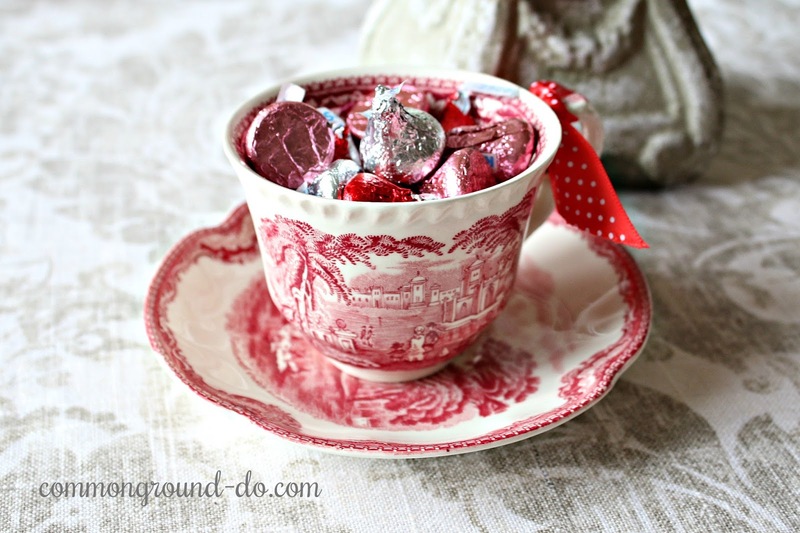 A romantic cup and saucer filled with candy or an aromatic candle is another idea. This one is Red Transferware, but anything with flowers or roses would be equally sweet. A little polka-dot ribbon dresses it up just a bit. Oh, and just one more place to stash a few morsels of candy. A set of old books can take on new importance with a ribbon, and you'll be amazed at some of the illustrations inside. Many are beautiful and interesting enough to frame. 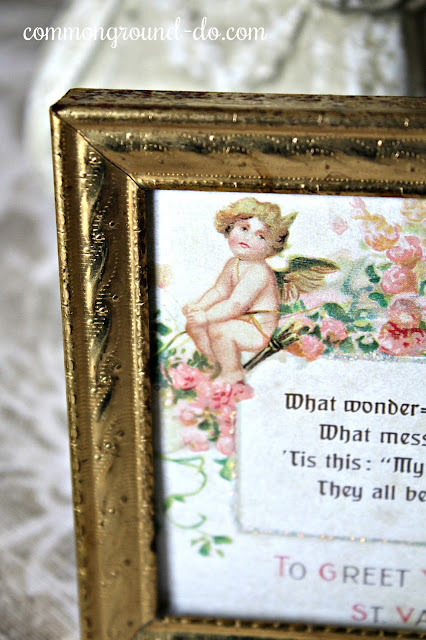 Another fun and easy way to make a special Valentine's Day "card" is to find an antique or vintage postcard, make a copy, add some glitter and then frame it in an old dimestore brass frame. Do you remember these? Every Grandma had them on the top of her TV or on a shelf filled with grandkids school pics. They come in all sizes, sometimes in twos or threes and usually cost a dollar at the flea. 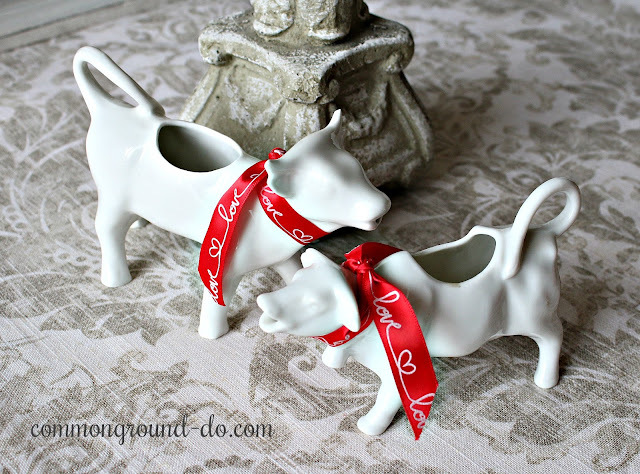 Ribbons on vintage cow creamers? but they wouldn't last long! 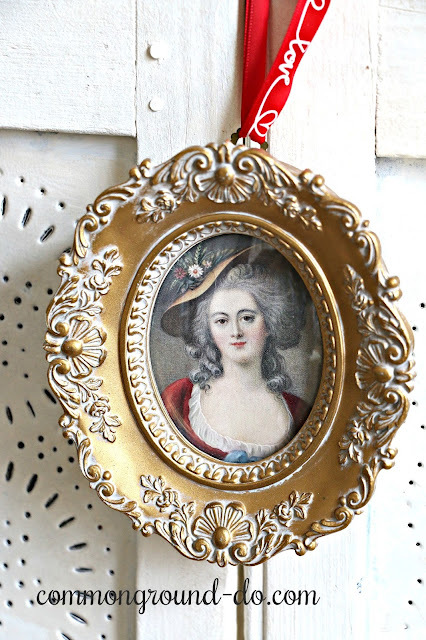 I made bunches of these little hanging ephemera assemblages when I had a shop space. These are on old Bingo cards that I just happened to find in red, and added copied vintage school Valentines. The above rose mug, I think is a shaving mug. 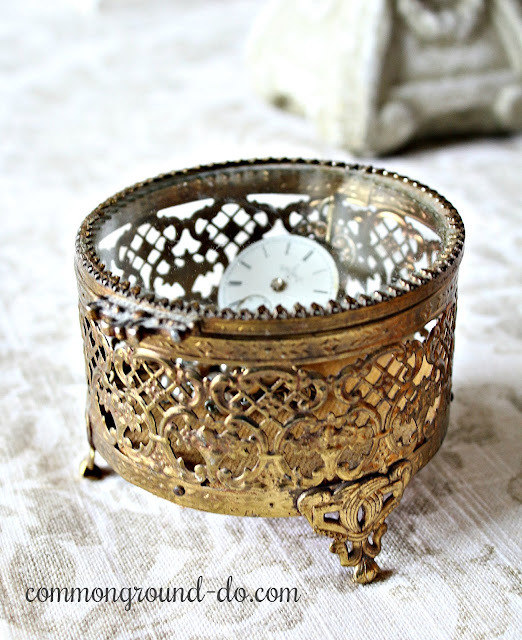 But anyway, so cute for a pen and pencil holder on your desk or vanity. 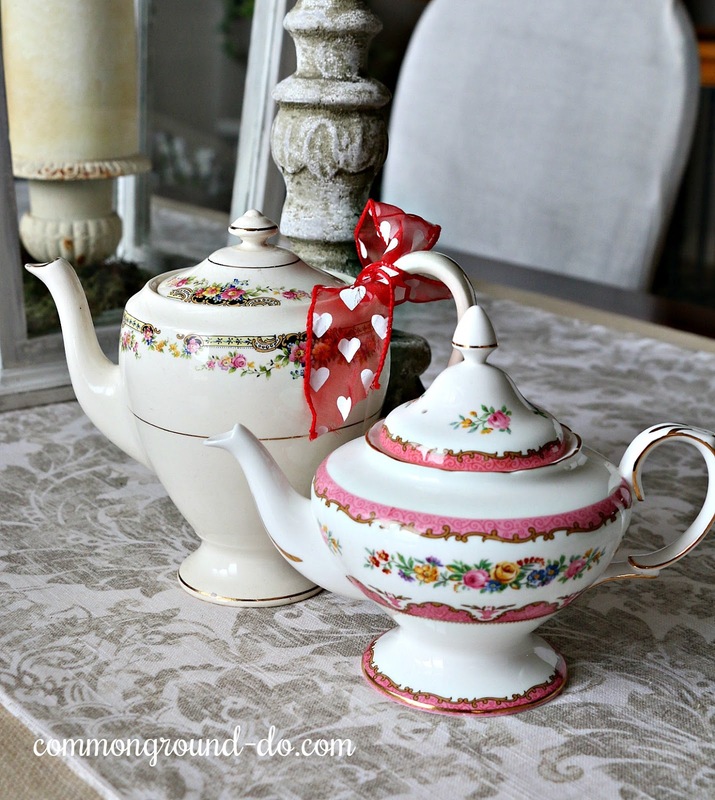 Vintage china and pottery teapots in a feminine floral motif are fun too, filled with candy or a small bouquet. 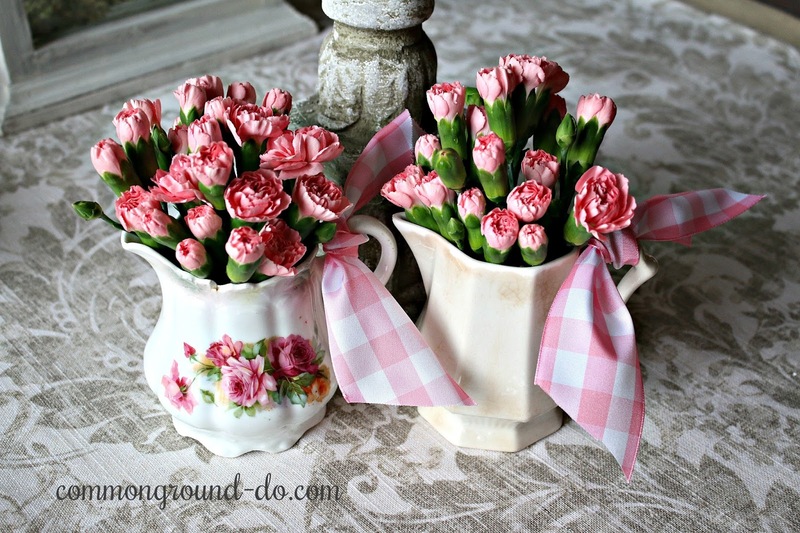 Even orphan sugar bowls and teapots without lids make for a cute display for ivy starts, pens and pencils, or cotton balls, Q-tips, at the bathroom vanity. Two teensy creamers filled with mini Chrysanthemums. Individual pieces of vintage silver or silverplate can be a sweet addition to a bag or two of favorite candies, specialty coffee or favorite tea. Wrap a set of dessert forks or coffee spoons with ribbon. 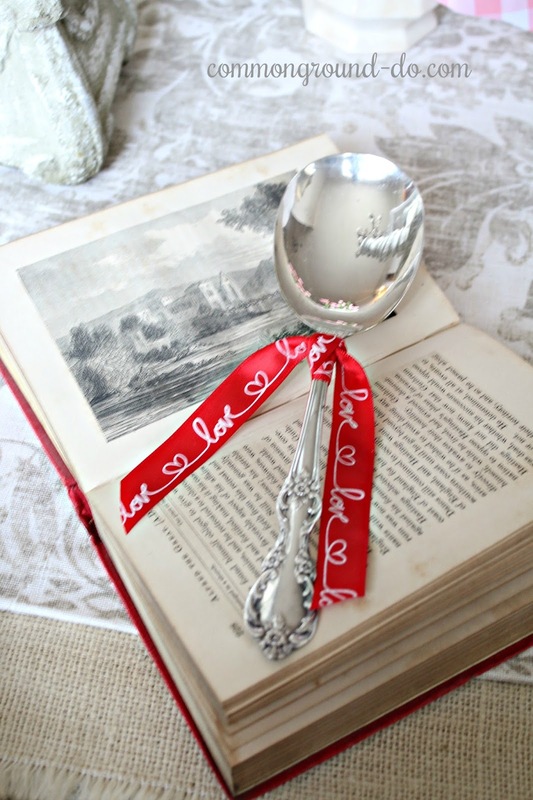 You can always mix and match your silver, especially at small teas and luncheons. 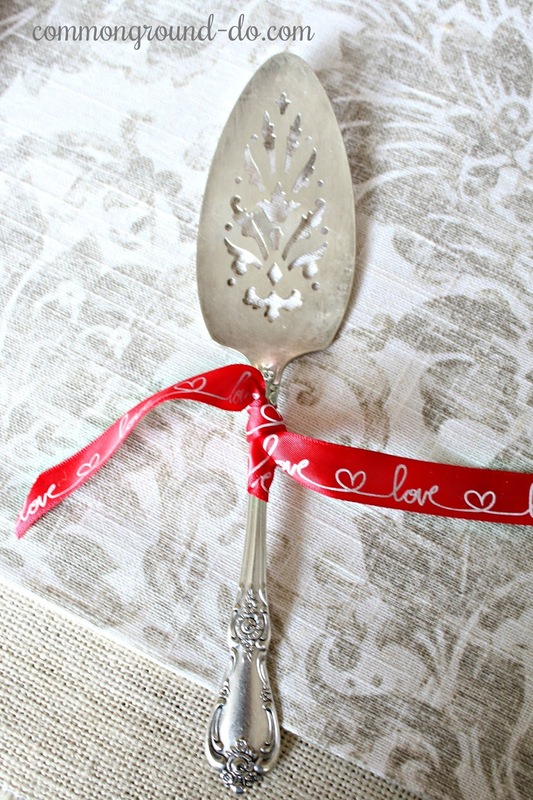 Who can't use an extra vintage silverplate cake or pie server? 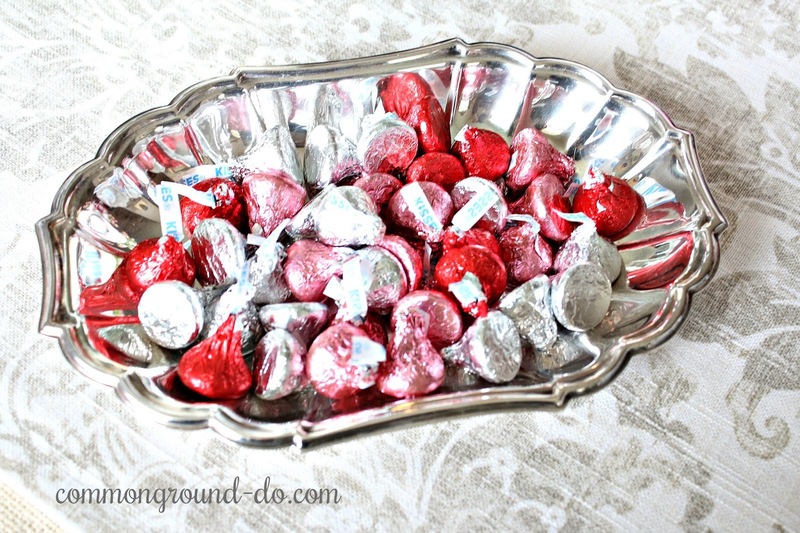 A vintage silver candy dish can be filled with individual candies, homemade truffles or macaroons. yum. There are so many ideas for ways to use small vintage items. of course I didn't make these, but don't they look fabulous? Please be sure and check out all our friends participating today, the list is below. 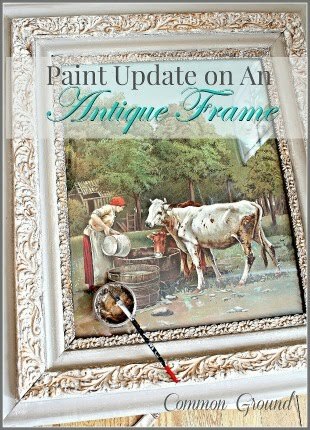 Linda always has some vintage fun up her sleeve and I hope you will head on over to visit Laura at Decor to Adore. 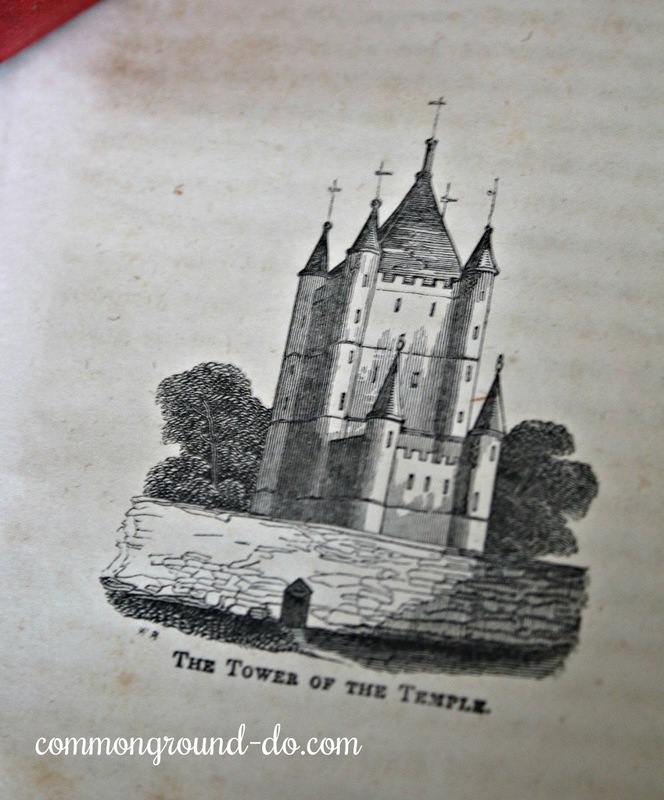 A BIG thank you to Amber for all her hard work and diligence to make this a fun and inspirational Blog Hop! 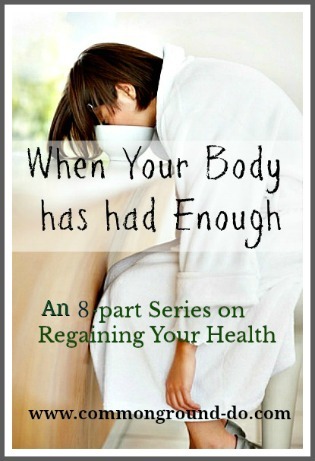 If you're new here, I'd love for you to follow along and sign up for email notices of new posts at the "Subscribe Here" box at the end of the post. 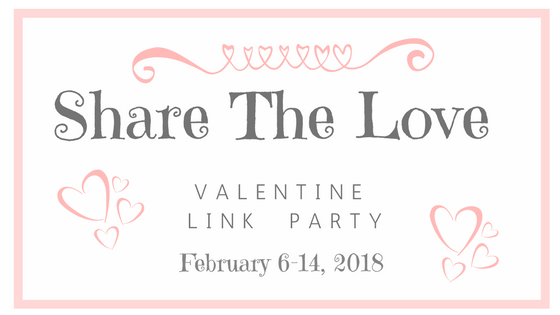 We hope you'll come back at 5:00 PM Eastern, and 4:00 PM Central today, Tuesday February 6, to join in on the Share the Love Valentine Link Party that will be live and link up all your own Valentine posts from this year and year's past. Don't worry if it's not "vintage", we want everyone to come share their own ideas and inspiration for Valentine's Day. 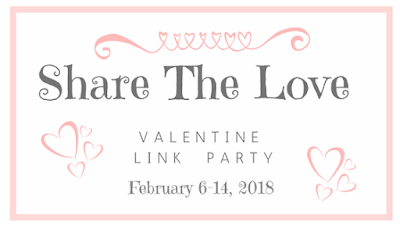 The Linky Party will be open until 11:00 PM on February 14, so you have plenty of time to add your future posts this week. Debra! 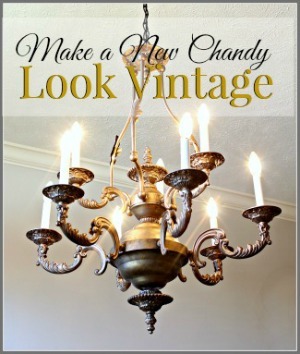 I can't believe my eyes...we have such similar vintage style! I absolutely love all your treasures, and we were on the same wavelength as usual for this hop! 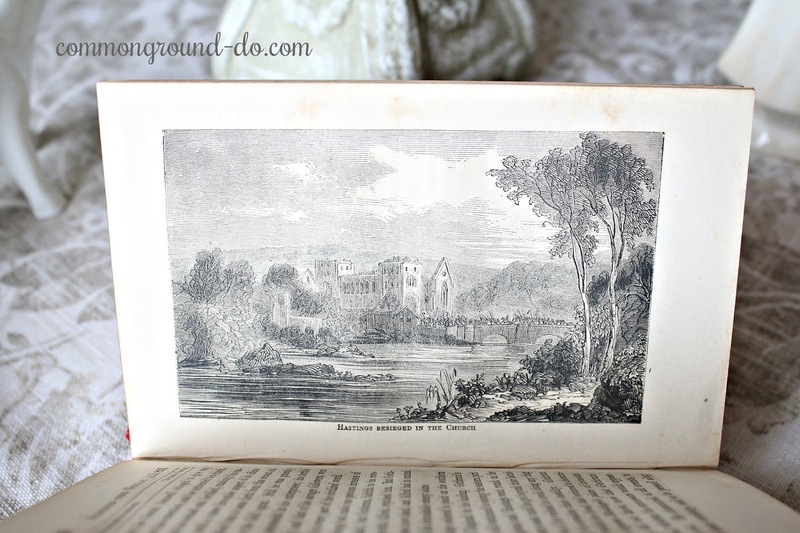 Wow, I knew it was going to be a gorgeous post when I saw your first picture. 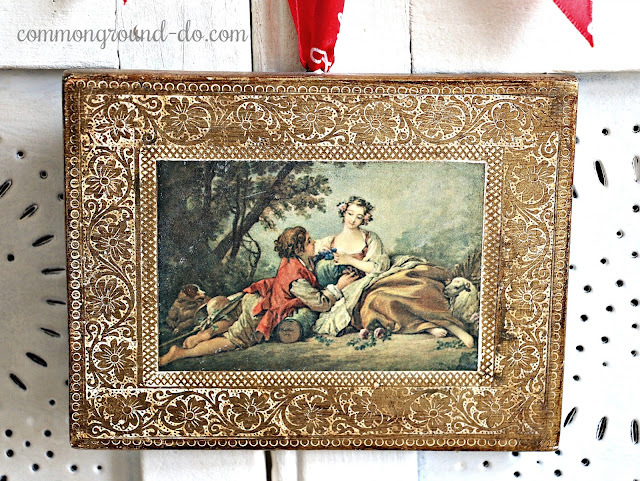 I love your Florentine treasures! 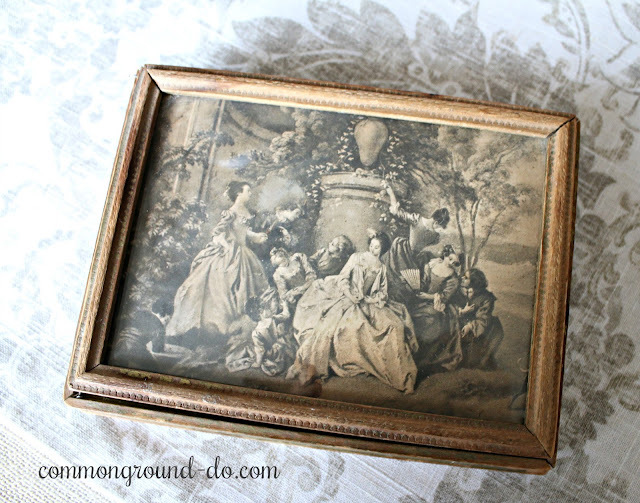 I have a few more small pictures like yours that I shared in my post, Not So Junky Junkin' Finds in my Junkin' Finds category. I love the little pitchers, and everything here! I will be back to look again later this afternoon. Love it all! 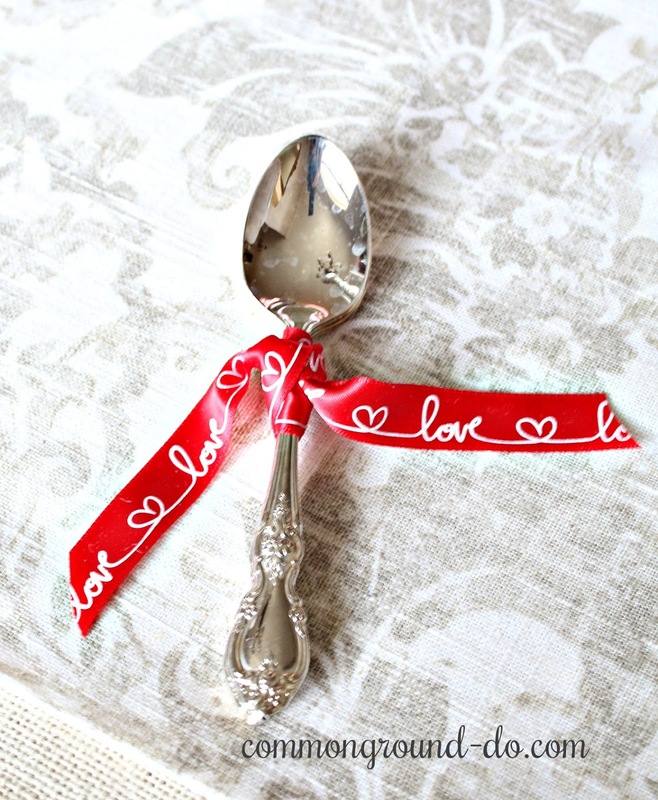 Yes to ribbon on everything! 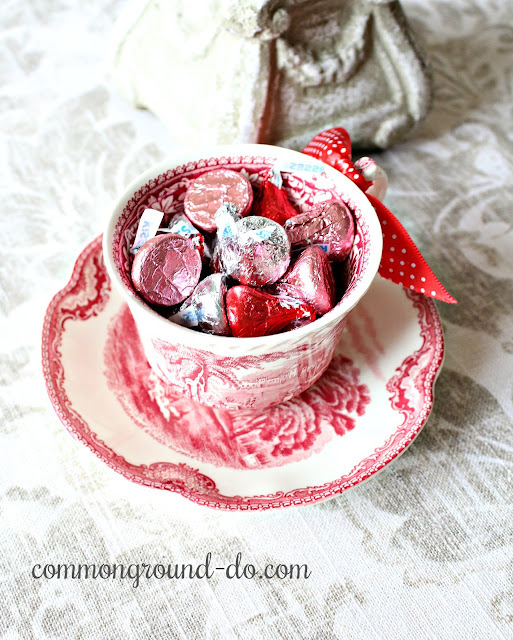 I adore your Florentine collection and of course we share a love for red and white transferware. Happy Valentine's Day! How lovely, Debra! You make me look at my romantic items in a whole new way! 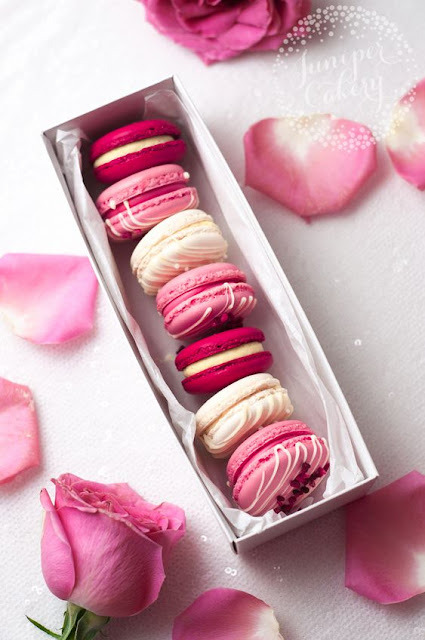 And such a sweet idea to add them to a Valentine gift...who wouldn't want to receive that? 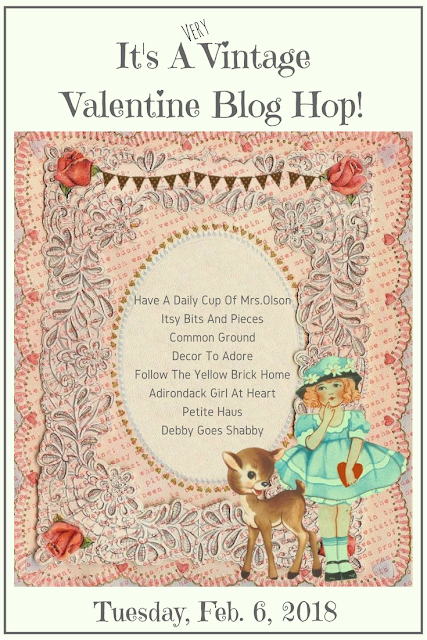 Thanks so much for hosting the blog hop! How very pretty, Debra. I've always believed a little ribbon can foof up the plainest of things into the loveliest and you show it here (though I confess, nothing was plain, even without the ribbon!) I especially love it on your silver and the prints. Your transferware makes me swoon! 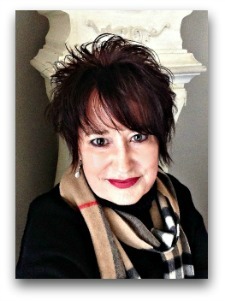 Debra, I love all of your gorgeous art pieces and boxes! You certainly have a way with ribbon. I love it on the cow creamer! I would not have thought to do that. Your pitchers of flowers are so beautiful. Definitely romantic! These are great ideas, Debra. Thanks for sharing! Debra, I love the idea that something a simple as pretty ribbon can add so much charm to your howm :) And I've fallen in love with your Valentine Bingo cards...I may borrow the idea, if that's okay with you!! What a lovely collection you have! The red and white made my heart beat a bit faster! 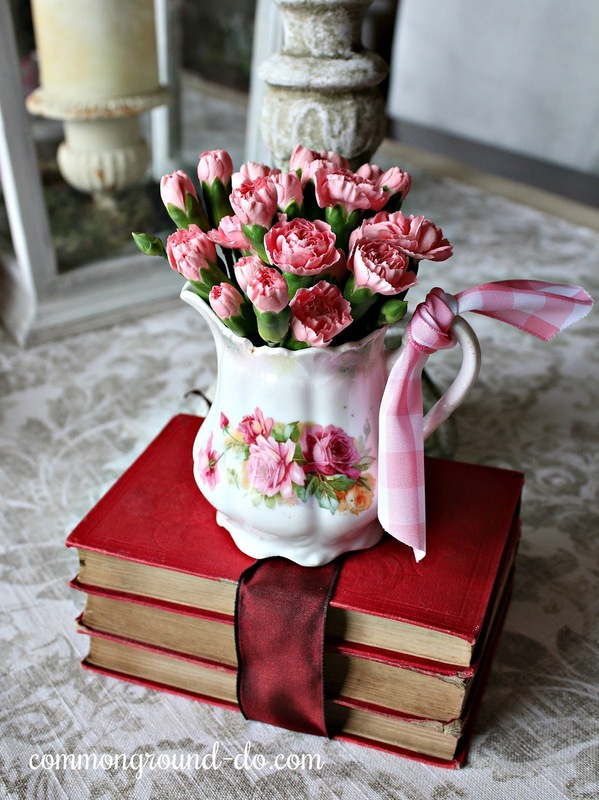 Oh my word, such romantic and beautiful Valentine collection you have displayed here dear Debra ! Those darling creamers are something else... they make me sigh.. Thank you for this wonderful party I never joined before, to celeb such a romantic month such as Valentine's. 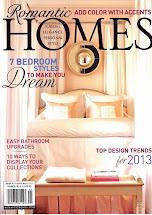 I love the curious, understated and elegant approach you took with decorating for Valentine's Day. So pretty. Thank you so much for hosting this great party every week. Back again! I love the little dime store gold frames. They are perfect for small vintage photographs of family members and look sharp in a collection several grouped together. 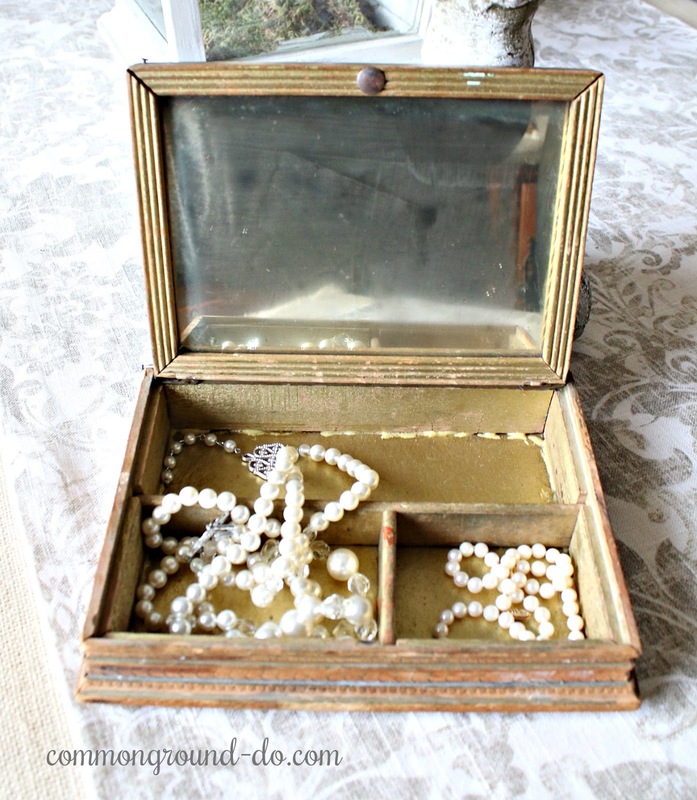 I included my Florentine jewelry box and I had intended to open it up and fill it full of vintage brooches for the blog hop today, but I got sidetracked and forgot! I also pulled out my little rosy ironstone creamers and did not remember I had set them out to style them for the hop until I saw yours in your post today. Looks like I need to do another Valentine post to link up to the party. Pinning so many images here. 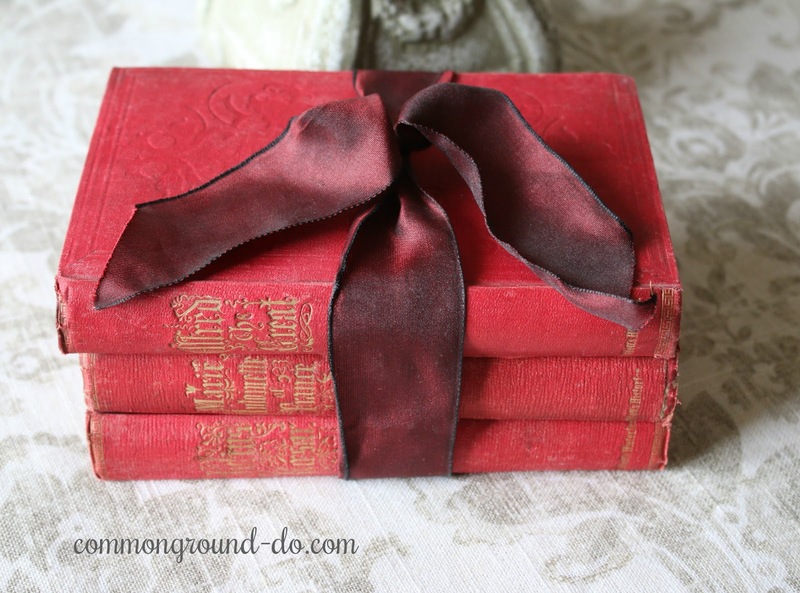 I love the books with the ribbon. Stealing that idea too! Thanks so much for all of your inspiration! Your decorations are beautiful as always...I joined in on the fun!